Thanks to the generosity of our donors, we have completed Phase 1 and are moving into Phase 2 of our senior lab upgrade project. The University took note of our mobilization of resources and moved to add their own support to the initiative, allowing us to move to Phase 2 ahead of schedule! We wish to express our tremendous thanks to all of the alumni who made this possible. 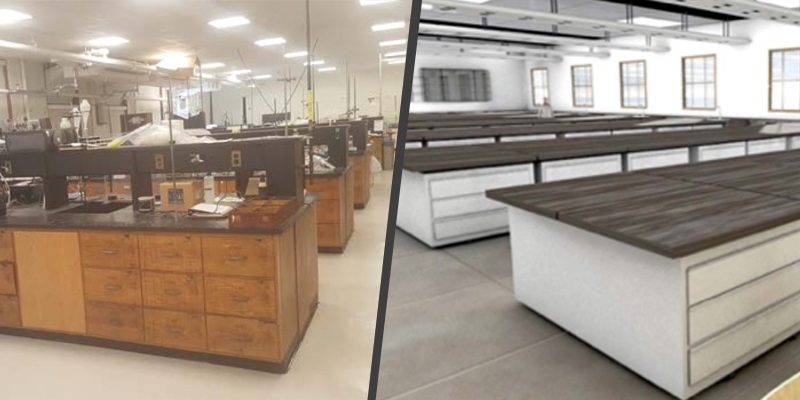 Our donations have helped catalyze university support and detailed planning for a complete renovation of Goessmann laboratory 62 and conversion of 67 into a biotechnology wet lab starting in fall of 2019. Going forward, we wish to build on this momentum and pivot our laboratory fundraising efforts to focus on several key pieces of equipment and experiments to further enhance the senior unit operations laboratory with focus on materials (after biotechnology, our second largest sector of undergraduate employment) as well as traditional process engineering. Target experiments include polymer injection molding, atomic layer deposition/chemical vapor deposition, and a heat pump and refrigeration experiment with controls. These experiments come with naming opportunities for corporate or individual sponsors. You can find more details regarding our overall departmental progress and strategy in the spring newsletter. If you would like to add your support to the efforts, please click here. We have launched a new bio-technology laboratory, involving microbial engineering and expression experiments. A cohort of 25 students from senior lab is already enrolled starting in January 2018. Other improvements include enhanced safety measures, replacing a reactor on the methanation experiment, augmenting the rheology experiment, and purchasing gas mixing equipment to increase flexibility and decrease costs for the gas permeation experiment. Corporate sponsorship is a critical component of our efforts to raise $185,000. These funds will leverage the university’s commitment to renovating the infrastructure of the labs. Your company will receive acknowledgement of its support of this project online, in our newsletter, and for gifts over $10,000, inclusion on a plaque in the renovated space. In-kind donations of equipment and materials are also welcome and may have significant tax advantages for your company. Your company’s gift will have an important and lasting impact on the quality and competitiveness of our department. Several naming opportunities are available during this project as well. To discuss how your company might support the Department of Chemical Engineering, please contact Jennifer Wong, Executive Director of Development for the College of Engineering, at 413-545-6396 or jenniferwong@umass.edu.